Despite living and growing up on a dairy farm, Travis Smith's hunger for horses never went away! However, it was his first job as a young milker, biking to work after school, that allowed Travis to purchase his first horse. 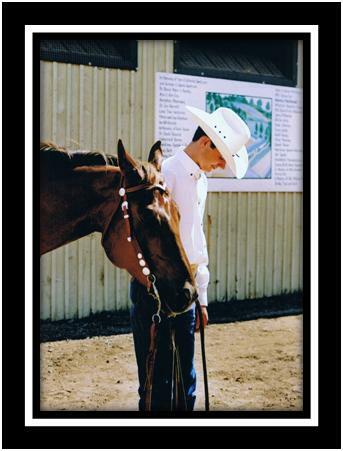 Travis showed locally and in the 4-H show circuits before he found his passion for starting colts and reining. Travis credits the late Jim Durling for this turning point in his horse career and still greatly values the influence Jim had on his horsemanship. Over the next few years, Travis developed from a green reiner to open competitor, enjoying the thrill of showing reiners. He also quickly earned a reputation as the "go to guy." Travis was always getting calls about starting horses or fixing problems. During this period, Travis attended the Nova Scotia Agricultural College and earned a Diploma in Enterprise Management-Equine as well as a Bachelor of Science (Agriculture) Major in Agricultural Business. While attending college, during his summers, Travis took the opportunity to expand his knowledge and experience by working for and with Roger Brazeau (NRHA World Champion and Hall of Famer), Todd Crawford (NRCHA Two Million Dollar & All Time Leading Rider) and Farm Credit Canada (Canada's leading lender to agriculture). After graduating from college, Travis accepted a position at Ferme Equestre Excailbur near Montreal, Quebec. Working with Matt Hudson, an up and coming NRHA trainer, Travis expanded his reining experience especially in developing futurity prospects. Now, Travis is excited to be fulfilling his dream of running a sucessful equine business in the Maritimes. TS Performances Horses will consists of what he enjoys most, training horses and helping equine enthusiasts learn more about horses!